I have spent the past week watching over my daughter as the virtual sole caretaker. Through it all, I was aiming for greatness. When it comes to watching over and caring for their daughters, fathers seek to create a lifelong bond with their female offspring built upon trust, protection and fond moments of truly connecting on the deepest of levels that will remain with us for the rest of our lives. Most people who have seen this movie remember it fondly for its high body count and fantastic (some say cheesy, I say fantastic) one-liners dispensed from Arnold Schwarzenegger at a pace nearly as rapid as his fully automatic machine gun spits out deadly rounds at his victims-to-be. What many forget is that this story is perhaps the greatest exhibition of a father’s love for his daughter ever, fiction or reality. 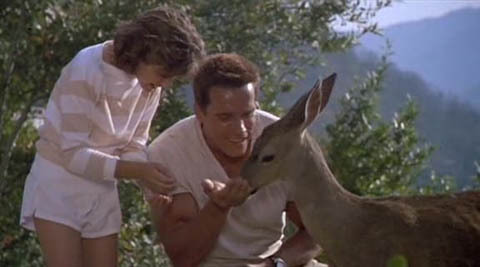 While this theme ultimately centers upon merciless revenge enacted upon hundreds of people for conspiring to kidnap his daughter, Schwarzenegger truly shows what it means to be “dear old dad” in the early and oft-forgotten scenes of this cinematic masterpiece.